Tired of flipping through dozens of tiles in the hope to assemble a cavern suitable for your adventure? Cavern Tile Designer allows you to design and print all the tiles for your cave complex in few minutes! Now you can run your evening adventure with tiles ready for the whole cave complex! 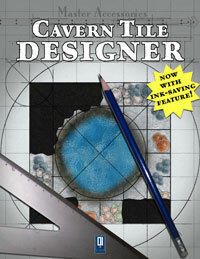 Cavern Tile Designer is easy and intuitive and you don’t need any drawing skill to build a nice –looking temple tile. Following the acclaimed Dungeon Tile Designer, Wilderness Tile Designer, Tavern Tile Designer and Temple Tile Designer, Cavern Tile Designer is the ultimate tool for building tiles. The Ink Saving Feature allows you to dim your tile and print it by saving up to 70% of ink! In three easy steps you will be able to sketch down your cavern and produce every tile you need. 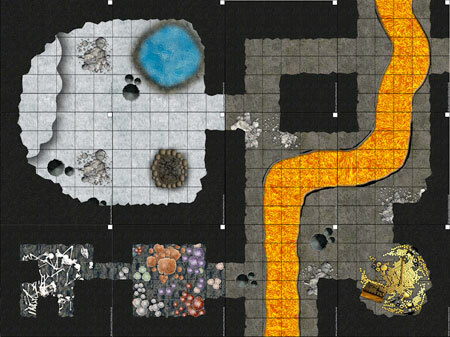 Now your players will enjoy a complete cave complex unfolding before them in every game session! 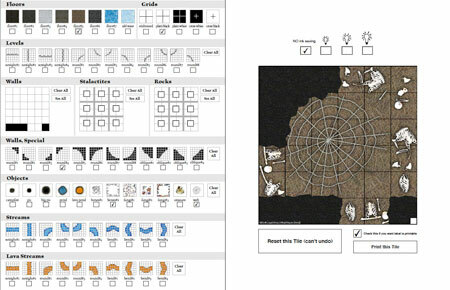 Cavern Tile Designer is not a drawing program (even if it would appear it is), it takes advantage from the pdf technology to assemble and combine pre-drawn dungeon tiles. Note: You Must have Adobe Acrobat 6.0 or higher in order to use this PDF, we recommend Adobe Acrobat Reader 8.0 for best results. The performance strongly depends from your machine' speed.